In the post below, I mentioned that plug-in electric vehicles could provide a form of energy storage, since, in theory, they'd charge up during the night, when power plants are underutilized. In 2007, one DOE study found that our current grid had enough nighttime capacity to charge up to 180 million plug-in hybrids, without the need for a single new power plant. Sounds good, right? But a reader points out that it's actually more complicated than that, and points to a more recent 2008 study by Oak Ridge National Laboratory. Basically, it all depends on what time people charge their cars. 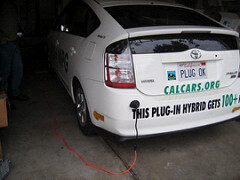 Assume that, by 2020, one-quarter of all cars on the road are plug-in hybrids—a mix of sedans and SUVs. When all those drivers get home from work, they're going to want to plug in the cars and start charging right away, because it's convenient and who knows if they'll want to sally back out after dinner. But electricity demand is already sky-high in the early evening, with everyone running their televisions and microwaves, so all that car-charging would put a huge additional strain on the grid. According to Oak Ridge, if everyone's powering up their plug-in hybrids in the evening, then by 2030, utilities could have to build as many as 160 additional power plants around the country to accommodate this extra load. By contrast, if drivers all charged up their cars after 10 p.m., when overall demand tends to be low, then all those cars could be slotted in fairly easily. At worst, eight extra power plants would have to be built. At best, zero new plants. But customers would need incentives to hold off. One option is time-of-day pricing—utilities could make it more expensive for people to charge their cars at 5 pm. Another possibility is "smart chargers" that are programmed to power up cars only when demand is low.